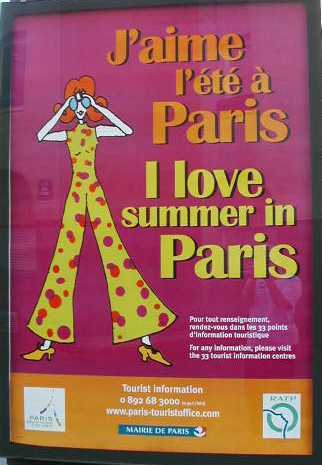 This poster is seen many places throughout Paris. It is part of a huge advertising campaign (beginning with the ill-fated Woody Allen video spots) that France has used to try to boost tourism. We'll never know if the campaign was effective because so many forces have been at play in the decline of American tourism in France. 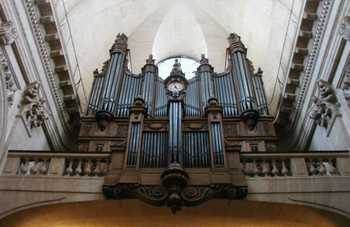 The organ at St. Thomas Aquinas church. We like this church because it is on a quiet little Italian-looking square, just off the bustling Blvd. Saint Germain. 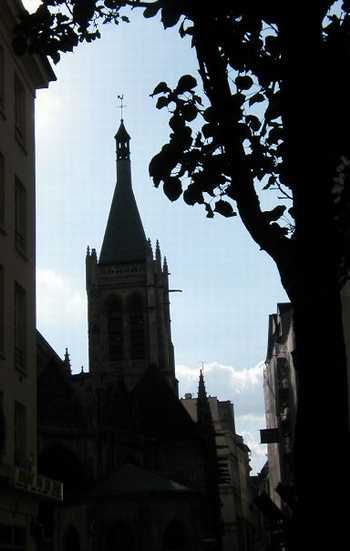 The steeple of St. Severin in the evening. Wearing the Kerry button in Paris continues to provide me with good experiences. Last night, we went to Le Bayadère, 51 rue du Théâtre, for dinner. As soon as we walked in and said "good evening," the young-ish man behind the bar, whom I recognized from last year, said that it had been a "longtemps." I hardly could believe this! We only went there a very few times last summer, and that was their first summer in business (they bought the former Pastel resto). Sure enough, when he came to our table after we were seated, he asked if it had been perhaps 6 months since we were there. I said no, it was perhaps 10 months. (Maybe it is more like 11 months.) He and the other young-ish man running the place both remember us. We must somehow make an impression but I don't know why. We are very quiet and reserved. Maybe that's why. Hmmmmm. Both men wanted to talk about Kerry. The French love him. We both indicated that we really hope he will win, but it isn't yet clear. The French seem to think Kerry will win for sure. I hope they are right. I had a similar conversation today with the two definitely young men who are running the wine shop I frequent. I think they are in charge just for the proprieter's vacation time. They both speak some English, but I tried as much as possible to stick with the French. The wine shop men asked if I'd seen Fahrenheit 911 yet. I told them I had not, but I will soon. I know I'll like it. They said they'd seen it and it was very good. They also asked about Kerry in the polls ("sondages"). I told them it was very close, within 2 to four points, and well within the margin of error. They were somewhat surprised. I guess they aren't reading Le Figaro because that newpaper has made it quite clear how close the two candidates are in the polls. I told them it was so very incredibly important that Kerry wins. That four more years of Bush would be truly terrible for the world. I told them that I wish that the Europeans could vote in the American presidential election. They smiled at that. But I said unfortunately that it would not happen. But that I wish that it could. Back to Le Bayadere -- a table of four middle- to older-age persons sat next to ours and one of the men immediately noticed my button. We exchanged thumbs-up signals and a few very approving words about Kerry. Food was perfect at Le Bayadère. Simple, and really good. Then this evening I have had my rude awakening. I was reading the AP news articles about the convention and post-convention events, and I happened to click on the link to the Yahoo message boards. Skimming through the messages that Americans have sent in abou the Kerry related news stories, I am devastated. They are so overwhelmingly pro-Bush, and so overwhelmingly simple-minded, profane, and stupid. Why aren't my fellow Democrats writing messages for the Yahoo message boards? Probably because they are too busy helping other people or helping the campaign. Finally the French papers included a little article about Brice Lalonde and his cousinship with Kerry. Brice was at the Convention in Boston, but he kept a very low profile. Why? Because he understands that it is not good for Kerry, politically, to flaunt his French ties. Brice said nobody had to tell him that; he just knew it. However, he was given a special identity tag and had the very best places at all Convention events -- far better places than other French attendees were given. Asked if he had visited any family members while in the U.S., he replied with a laconic "oui." If you don't know who Brice Lalonde is, check out the end of yesterday's entry. The weather is hot here, but it isn't in the 90s yet so we can take it. However, air quality is going down. Today Air Parif issued its first air pollution alert, telling infirm and old people to stay home with windows closed. Also, they asked people to avoid driving their cars, painting, and using certain chemical cleaners and solvents. All these things contribute to the production of bad ozone during hot, sunny days.